Had you told me eight years ago that one day I would be an elite marathoner, I’m not sure I would have wanted to believe you. In 2011, I was at the tail end of my undergraduate degree, hitting my head against the wall in the 1,500m. 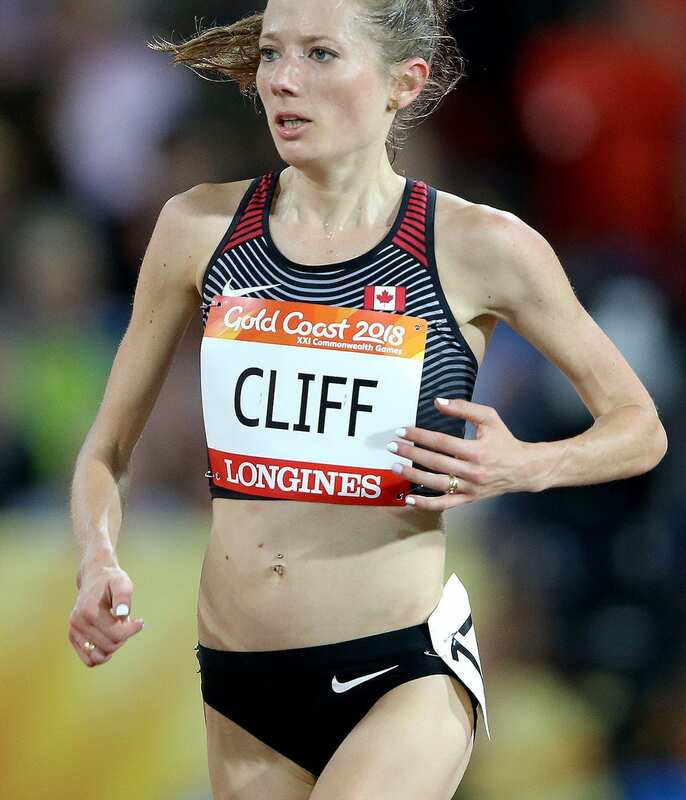 This period of my life can best be described as delusional — I have never had enough speed to be competitive at this event in Canada, let alone on the world stage, but I wanted to be that type of runner. As the years progressed, my coaches convinced me to focus on the 5,000m, and then the 10,000m. While I genuinely enjoyed the longer distances, and saw more success the longer I went, a move up to the marathon felt different. The previous changes I’d made were merely subtle event focuses. A 10,000m runner can easily drop down to 5,000m or even 1,500m – they are all track events, after all. But switching to the marathon represented an identity change, it meant a different style of training, which may not be immediately transferable back to the track. It meant learning how to fuel and leaving the predictable 400m oval for the changing conditions of the road. But for the most part, my fear of the marathon was about the potential for heartbreak. Track has a “season”, lasting about four months, and success is evaluated over multiple races. In the marathon, three to four months of training is measured almost entirely by one final race. The marathon pushes your body for speed and distance, which is inherently risky. A lot can go wrong in a marathon and in the training leading up to it. Some of that is within your control, some isn’t — the latter scares me most. We’ve all heard stories of marathon runners who were in peak shape, only to miss the start or finish line due to injury or illness or have poor weather on the day. The marathon rarely grants second chances. Despite my initial reservations, I have now completed two elite marathons — the 2018 Berlin Marathon and the 2019 Nagoya Women’s Marathon — without heartbreak. In fact, they represent two of my most enjoyable athletic experiences to date. Purely from the standpoint of outcome, Nagoya was decisively more successful — I ran almost 2 minutes faster than Berlin and set the Canadian record. But outcomes in sport are only the tip of iceberg, the real success is buried in the depth of the process. My achievement in Nagoya was largely a result of lessons learned in Berlin, and the story of that Canadian Record begins in the training for Berlin. Although I wouldn’t have admitted it at the time, my journey to the marathon started in winter 2017 when we decided to target half marathon to help my 10k that summer. It was immediately clear the training came naturally to me, and that brought some discussion of the marathon. We pushed more boundaries in the half marathon in 2018 and I set the Canadian Record that March. After that, discussions about the marathon went from hypothetical to inevitable. With no Olympic or World Championships in 2018, the summer was open for trying something new. Berlin, a notoriously fast race in early September, was the first choice. Sometime that year my reservations about the marathon switched to pure excitement. I trained 12 weeks for Berlin, and I remember most of it vividly, especially my first day: it was a warm summer morning, I was only running seven miles, but these were my first conscious, intentional steps towards a marathon. By the second week, my running volume had ramped up and my initial optimism was put in its place, but those 12 weeks remained a positive experience. I learned a lot in that first marathon build. Despite being a veteran runner, the marathon was unfamiliar territory — the style of training was different, rest was more critical, and I had a lot to learn in terms of how to fuel in the race. I was fortunate to be working with an experienced coach—Richard Lee — who understood the event well and had coached several athletes to success in the marathon, including 2012 Olympian Dylan Wykes. I also read marathon blogs and articles and spoke to other marathoners. Two lessons from Berlin stand out. Patience. In marathon training, you need to find a sustainable rhythm while getting a tired body to run reasonably fast. It’s an art that doesn’t always come naturally. Early on, in a workout of kilometre repeats off a minute of rest, I learned this lesson the hard way. I opened at the assigned pace, but where it should have felt controlled, and I should have been able to speed up from there, I could tell I was working too hard. Rather than re-adjust for the obvious fatigue, I pushed through, hoping it would turn around. This approach might have been okay for 5k or 10k training, but it was detrimental in a marathon block. The harder I fought to run fast, the farther off the pace I fell, until we had to add rest to allow me to recover. In time I learned to let the paces come to me and not the other way around. There’s no event where this mindset is as critical as in the marathon. Fueling. The first time I tried fueling during a warmup. My coach handed me bottles from his bike and I was shocked by how heavy they were and how tough it was to drink while running — this was at an easy pace. I faced more challenges fuelling in marathon paced workouts and learning how to pick up a bottle from a table in practice. I also had to become familiar with how much to consume. To design a fuel plan we meticulously weighed the fuel bottles pre and post workout to learn exactly how much carbohydrates and water I consumed. The training for Berlin and the race itself went more-or-less to plan — when the fatigue came, the paces I hit in workouts, most of it unfolded as expected. I loved the community aspect of marathoning, my teammate Catherine Watkins also targeted Berlin, and we commuted to practices and warmed up and cooled down together, and Rich biked with us to hand out bottles. There’s a huge sense of comradery which comes from training for a marathon together; you understand what the other has gone through. I was also fortunate to have family keen to be involved when I was away from my training group. While we were at a wedding in Ontario, my husband, brother-in-law and his fiancé drove along the Orillia Rail Trail to hand me bottles every 5k. The deeper I got into the training, the more appreciative I became of anyone willing to share in my journey. Throughout, I felt fortunate to still be a student of my sport. Berlin went well for us — Catherine ran a personal best and set a Canadian age-group record of 2:40:11, and I ran 2:28:53, the fastest debut by a female Canadian marathoner. After Berlin I was drained — I’d given it everything for three months of my life and in my eyes, it had been perfect. I was partially scared that another marathon wouldn’t match it. Fast forward to late November when I started training for my second marathon: from the outset, Nagoya was nothing like Berlin. The plan had been to target the Tokyo marathon, but I hadn’t been confirmed (or rejected) for the start list yet. Nagoya was the backup plan, picked for timing and location. In contrast to Berlin, I have little recollection of my first days training for Tokyo. Going into Berlin I was excited, but with this second one, my mind was already at the Tokyo finish line — I wanted a Canadian record and an Olympic qualifier — but I wasn’t ready yet to put the work in to get there. Almost immediately, the Tokyo training went sour. We pushed more volume because the goals were bigger. I was exhausted in a way I didn’t remember being before Berlin. When I got tired while training for Berlin, I could rely on residual leg speed from the summer track season, but this time, I didn’t have the same fitness going in. When workouts went south, they really tanked, and left me tired for days. When my agent called to share the news that I didn’t get into Tokyo, I was somewhat relieved. We put in applications for some later marathons and waited to see what came back. Things got worse. A week of recovery did little to help my fatigue, then my foot flared up and I had to take a few days off, and the terrible workouts continued. We decided to put the marathon on the backburner, drop my mileage, and focus on the one race I did have planned — the Marugame Half Marathon in early February. Ironically, I had just started to come to terms with not doing a spring marathon when Nagoya offered me a spot on the line. Rich and I weighed the pros and cons. How realistic was the marathon at that point? The training had been difficult, but I still needed more marathon experience and I had some good volume from December under my belt. For whatever reason, targeting Nagoya felt right. By the time I realized I was training for Nagoya I was already five weeks in and focused on the Marugame half marathon, which was quickly approaching. Reflecting on my experience from Berlin, I remembered to let the paces come to me — not the other way around. This meant removing some of the pressure I had put on myself to run the Canadian record. It meant enjoying the training more. We didn’t push volume as much, trusting the base I already had. When workouts started to go well, I didn’t take the same confidence from them because I felt more rested. When I went to Marugame and ran two minutes faster over the half marathon than in the Edmonton half (which I had run before Berlin) I came up with explanations that didn’t have much to do with fitness: I was more focused for the Japan race, the competition was deeper, my training was more geared to the half marathon than it was before Berlin, so of course I ran faster. Looking back, the signs actually pointed to my fitness being similar or better, but I didn’t dwell on it. Berlin, in my eyes, was still the perfect training block and Nagoya was the scrappy afterthought. After Marugame my workouts continued to progress, but there were a few speedbumps: the jetlag set off GI trouble and I couldn’t get through a workout without having to stop — something I never dealt with before Berlin. Then it snowed in Vancouver, something our city doesn’t handle well. Then I dropped a cutting board on my toe. Then two weeks out of Nagoya, just as my gut issues got under control, I went on antibiotics for an infected blister. Nothing required me to stop training, they were just little adversities that required specific attention, and shifts in the plan. This was also when my experience from Berlin helped. I understood better that the marathon is not about one week of training, or one workout, it’s about the entire block. Even I could see at that point the training block was going well. I was nervous when I stood on the start line for Nagoya, but I also had a calm curiosity. I was thankful to be healthy on an elite start-line, and I couldn’t help but wonder how the race would play out. Things had felt disjointed and unfocused at times, but the workouts had come together nicely, my coach and I both knew the fitness was there. When the gun went off, the race played out to perfection. The temperature was ideal, 10 degrees with light rain. Grabbing bottles came more naturally. The pacers hit every kilometre perfectly, so there was no stress about tempo. The race was broadcast on national Japanese TV and for 42km, the streets were lined with thousands of fans cheering on a women’s-only sporting event — something few female athletes get to experience in their career. The best part was, it felt relatively easy. I went through the half marathon with the group, feeling confident. At 27k my legs started to fatigue a little and I chose to run on my own, but I didn’t slow much. The “big hill” at 33k was smaller than I expected, every time I saw my coach on the course I could tell from his voice that I looked as strong as I felt. The last 4k were tough — as they inevitably are in the marathon — but I was still on a good pace. In the final 200m the course went around the stadium that we finished in. It was the only portion of the course that didn’t have fans. This is when I let it hit me: I was moments away from a personal best, a Canadian Record, and likely an Olympic standard. After just missing out for the Rio Olympics in 2016, it was this final point that excited me the most. Although it doesn’t ensure selection, I was about to run a qualifying time in the IAAF’s window for the 2020 Olympics. Some people have asked me how I shaved off two minutes between my first and second marathon, but the truth is, I’m not sure it was so abnormal. The training plans were well designed, and so my fitness improved from one marathon to the next. I was fortunate in both races in that things beyond my control worked out: the weather, the pacing, my health, were all good. I did everything going into Berlin to make the training and race perfect, but that made me scared to push boundaries. The training for Nagoya was stressful, and I felt less control over it, but it fit together perfectly when it needed to. Less energy was spent learning about the marathon because I’d done that for Berlin. In Berlin, I was a track runner going through a box-checking exercise of completing a marathon. But I ran Nagoya with the confidence of a marathoner, and I think that’s a critical difference. My reason for initially fearing marathons is why I’ve become so infatuated with them: when so much can go wrong, the good ones are truly magical. A: How about? "Adventures with my indoor cat: the not-so glamorous life of a professional athlete." Q: What word or phrase do you over use?